I started this project in 2016. I got the idea when, as I often do on a Friday, I was searching for local events or places of interest we might want to go and have a look at during the weekend, and I came across the Saints and Stones website. 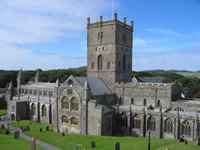 It’s a brochure site setting out information about various suggested trails of churches and other religious sites here in Pembrokeshire. It covers a lot of places which we already know but, since we are not churchgoers, it points us towards buildings and historical information which we wouldn’t usually notice. For instance, it hadn’t occurred to me that clifftop churches might be used as navigation aids by sailors! Or, indeed, that the reason some churches are in such secluded places is that they needed to be hidden from marauding pirates! The Saints and Stones Group supply guide leaflets to all of the places included in the trails, with information about each of the churches and other monuments you might visit. I’m grateful for their help and I’d encourage you to visit their website to find out more. There are a lot of places to visit on these trails so this project may last for quite a while, but there’s no rush, and we’ll probably skip from one trail to another rather than following each in turn. You can use the dropdown on the My Projects>Saints & Stones Menu to find the entries and also a map showing their locations.